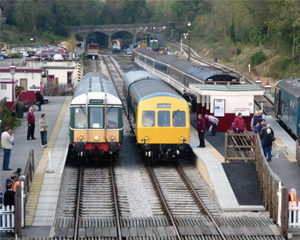 We operate passenger services on the line between Wirksworthand Duffield mainly using heritage diesel railcars, with some steam hauled services on the short branch between Wirksworth and Ravenstor. The Ecclesbourne Valley is one of Derbyshire’s most lovely and unspoilt valleys, stretching from the northern outskirts of Derby, at Duffield, to Wirksworth, an ancient market town known as the Gem of the Peak. By taking the train to the line’s far northern terminus at Ravenstor (on its own little branch line from Wirksworth) those of you who like fresh air and a pleasant uphill ramble can join the High Peak Trail, from where there are nearly twenty miles of traffic-free paths into the heart of the Peak District. From this same destination at Ravenstor, you are just a few minutes’ walk from the National Stone Centre and the Steeple Grange Light Railway, and close to Middleton Top Visitor Centre and the Black Rocks picnic area.